October has kicked in with busy but, very exciting schedule! As a visiting artist/scholar at Cornell Unviersity (thanks to the invitation from Dr. Geri Gay & Leo Kang at Information Science,) Younghui participated at The Breakfast Talk on Wearable Art (shorter concise version) at Information Science Department at Cornell University. There were good group of audience made of BFA students to PhD candidates and professors from both Fine Art School and Information Science School. She has presented some of her wearable projects and her inspiration and interests in old and new smart materials. The room had a great energy and she has received great feedback from everyone. Younghui had scheduled a three day trip to Chicago on the way to Ithaca, NY and Insook Choi from Columbia College of Art has invited her to give a special talk at Creative Technologies Forum in front of members of the provost office, faculty and students from Art + Design Dept, Fashion Studies, Product Design Dept. 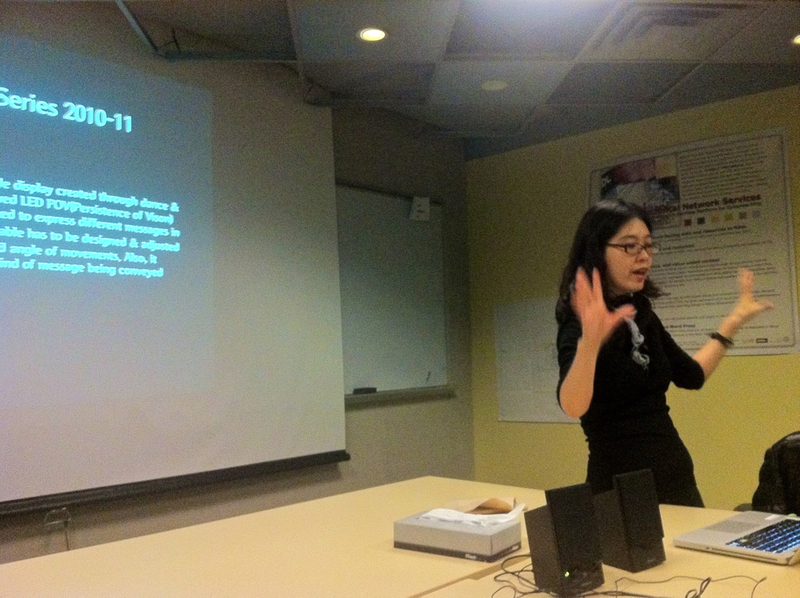 Younghui gave one hour presentation on her teaching method, philosophy as well as presented selective wearable projects. She had a very heated Q & A session with positive feedback and idea.